This is a tutorial and instructions on how you can unlock your Nokia E7 by Unlock Code to work on any GSM network. The new Nokia E7 has a 3.5″ touchscreen with 360 x 640 pixel resolution. The Nokia E7 works with a 680 MHz ARM 11 processor and runs on the Symbian^3 OS. The dimensions comes to about 123.7 mm in height, 62.4 mm in width and 13.6 mm in depth and weighs about 176 g. The Nokia E7 has 16 GB storage and 256 MB RAM. There is a 8 megapixel camera with 720p video capture. 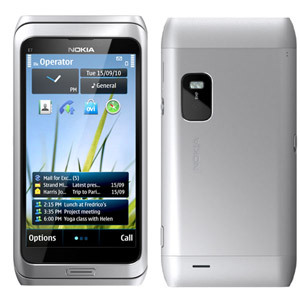 Cellunlocker.net is proud to announce we are unlocking the Nokia E7 fast and easy. Cellunlocker.net is proud to announce we can Unlock the Nokia E7 to any GSM Network fast and easy! Once you unlock your Nokia E7 device, you can change to any GSM Carrier. 3. The phone show “SIM Restriction Off” and is unlocked! UNLOCK MY Nokia E7 NOW! * The resell value of the Nokia device will increase significantly as it is available to more carriers. * There is absolutely no risk of damaging your Nokia E7 by unlocking it. hey i have a nokia e7 locked to orange either from poland or the uk. IMEI is 354864048167028,i need to unlock it to use it in the states,*Note: if you have previously tried to use a faulty code to unlock this device make sure you have enough attempts to enter the code*(I THINK I DID THIS BY ACCIDENT)Is there any way to go around that?